The Feststellungsprüfung (abbr. FSP) is a test to assess the suitability of foreign applicants for academic study in the Federal Republic of Germany. This test must be taken by applicants whose higher education entrance qualification, i.e. school leaving certificate, is not fully recognized in Germany. Those who pass the FSP can generally study at a German university or any other institution of higher education. The FSP is not, however, a guarantee that one will receive admission to a German university or other institution of higher education. Those who do not pass the FSP have the opportunity to retake it once; this can be done at the earliest half a year after the first attempt. Studienkollegs prepare foreign applicants to take the FSP, for which students typically prepare for one year. During their year at the Studienkolleg, students take four or five courses, in three of which – depending on the chosen area of focus – a mandatory written exam is administered. German is always among these three courses. The proficiency in German attained at the Studienkolleg must enable a prospective student to successfully participate in courses in the desired area of studies. Exams have a written and oral component. The Steinke-Institut has a faculty composed of certified Chinese, English, French, Italian, Russian, Spanish, and German teachers as well as economists, biologists, chemists, historians, lawyers, mathematicians, physicists, psychologists, sociologists, and theologians. 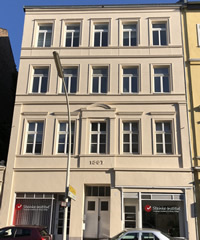 In 2001, the Steinke-Institut started offering preparatory courses on behalf of its academic partners in the areas of economics and technology. These preparatory courses prepare prospective students for the admissions test to these universities and other institutions of higher education. Our experience offering preparatory courses for these academic institutions now helps us prepare prospective students to take the general assessment test (FSP). After a decision by the Government of North Rhine-Westphalia (NRW), state universities and other public institutions of higher education no longer offer the preparatory courses (Studienkolleg) for the assessment test required for admission (FSP). This means there are no more public Studienkollegs. The Feststellungsprüfung (FSP) is still, however, administered in North Rhine-Westphalia. The Steinke-Institut will prepare you for the college admissions assessment test (FSP) in two semesters: Courses from the Studienkolleg at the Steinke-Institut.